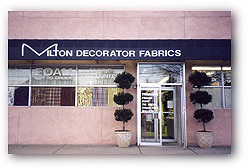 Since 1948, Milton Decorative Fabrics Inc., has been a complete window treatment, slipcover, bedding and upholstery center. Thousands of yards of fabric and trim are in stock, many designs and styles for all your drapery, slipcover, and upholstery needs. All at wholesale prices to you. Our fabrics and trim are current styles and of first quality. We give the customer a choice. You can buy yard goods and make your window treatments yourself. You also have the option to have us create them for you. Our in-house designers will offer suggestions to help guide you to create the look you desire. They will make sure you are pleased with the selections you have made. Milton houses its own staff of professional craftsman.